Are you comfortable talking with others about your relationship with God? While in general I’d say I’m comfortable engaging others in conversation about God — in no small part thanks to my evangelical upbringing and Bible school training — I’d also have to say that I’m not as inclined to “push” (or to try to persuade) as I once was. If someone gets argumentative or confrontational, I may direct them to a resource such as a book or article to study it on his or her own. Some forms of “apologetics” do more harm than good: winning the battle (the argument), and losing the war (the relationship). From my own journey, I can point to people who have crossed my path and invited me to “come and see” — whetting my appetite for truth. It’s a model that I’ve tried to emulate, with varying degrees of success. Would you say that you’re a “normal” Catholic using the criteria outlined in this article? While I think that it’s becoming more common for Catholic men and women (many taking their cues from non-Catholic Christian friends and family) to pursue a deeper intellectual and spiritual connection to Christ, the fact is that the Church is hemorrhaging souls. No question, there is “gold in them there hills,” but many are drawn to the pyrite, not realizing the riches that are available in the sacraments. In many ways, the people in the pews next to us are in every bit as much in need of an “invitation” as those outside our doors. They need to be invited to experience the love of Christ for themselves. And that invitation needs to come from us, meeting them where they are. Or are you a “typical” Catholic, fighting that feeling that interest in the faith is only for a few pious eccentrics? Sadly, there are “pious eccentrics” that are not helping the cause of Christ. In the name of “reverence,” they criticize and nit-pick and judge everything from the priest’s homilies to the music minister’s choice of song to one another’s actions and appearance — and forget to extend themselves to the “hoi poloi” beside them. They don’t see how coldness and austerity is creating an environment that obscures the grace, obscures the mercy available for us all. By the same token, some water down the Faith — in all areas of parish life — until there is little “meat” left to feed upon, and people leave because they feel they are starving. What we need is men and women who, out of love for Jesus, are willing to lay down their lives for the good of the “little ones,” those who are simply going through the motions. We need an infusion of community, and an infusion of unabashed intercessory prayer. That is what is needed if we are to cooperate with the Spirit to bring about a revolution of faith. 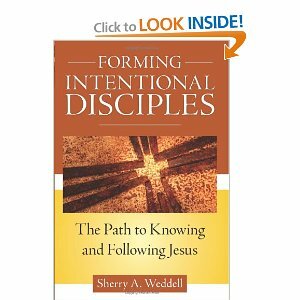 This entry was posted in Lawn Chair Catechism and tagged Dynamic Catholics, Forming Intentional Disciples, Lawn Chair Catechism, Matthew Kelly, Sherry Weddell by heidihesssaxton. Bookmark the permalink.